Ben Bernanke, the former chairman of the Federal Reserve Board, has an interesting post on his Brookings Institution blog. In it, Bernanke notes that stock markets have closely tracked oil prices over the past five years. His conclusion: "Much of this positive correlation can be explained by the tendency of oil stocks and oil prices to react in the same direction to common factors, including changes in aggregate demand and in overall uncertainty and risk evasion [emphasis added]." This is exactly what Torrens Hume had observed in a comment on an earlier post here and complementary to my own view that the beneficial effects of lower oil prices may be elusive. To recap, I had earlier suggested that the real income gains associated with lower oil prices may not be translated into aggregate demand if those gains are "hoarded" in the form of unproductive savings. One example is gold, which Keynes referred to as a "sterile" asset because it does not lead to productive investment. Another example comes when the savings stay in banks and are not lend to finance new investment or production. 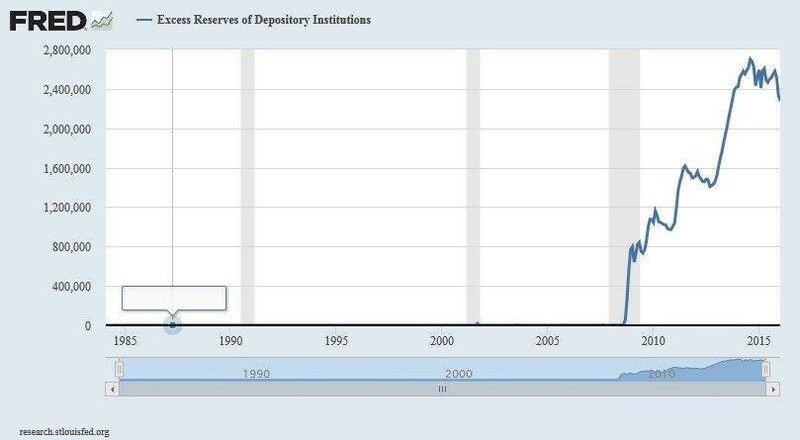 Evidence of such effects can be found in: (a) higher gold prices since the start of this year; (b) excess reserves held by commercial banks in central banks, which have mushroomed since the crisis. (See chart below from the Federal Reserve Bank of St. Louis). 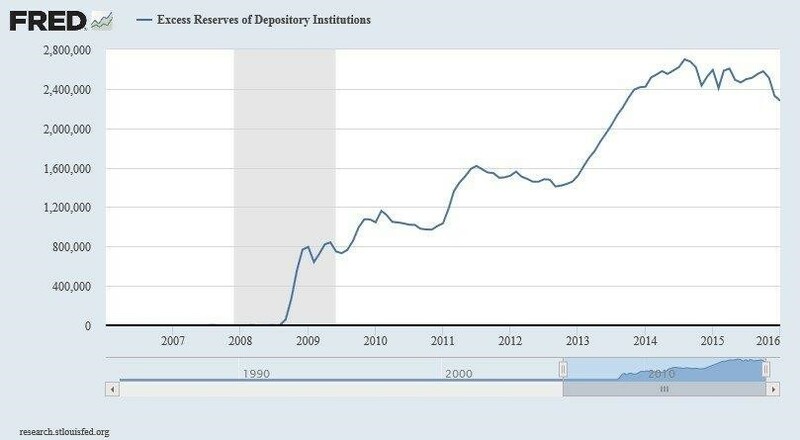 Now, these excess reserves reflect the extraordinary money policy actions of the Fed (quantitative easing) in response to the crisis and are to be expected. But the point here is that fully eight years after the onset of the crisis things still look very “exceptional.” For reference, the second chart below gives a slightly longer timeframe, starting in the 1980s. Apart from a very small, barely-discernible blip in September 2001, associated with the 9/11 attacks, excess reserves were white noise in the system -- they don’t even show up given the scale. What might drive this hoarding behavior? Well, the name of this blog pretty much says it all: We are in a new age of uncertainty in the presence of which households and firms exercise the option value of waiting, holding off on productive investments. Hoarding by households and firms is one manifestation of this option. The implication of all this for global growth is that, while the presumptive benefits from lower oil prices on aggregate demand may be illusionary, for countries such as Canada, which have suffered a negative real income shock from lower oil prices, the effects of lower investment are very real. Elsewhere, write downs of loans to the oil patch further weaken the capacity or willingness of banks to lend to other sectors. Needless to say, this wouldn’t be helpful to recovery.